Another day, another new entrant into the emerging solid state drive market. Hardware maker Asus is throwing their name into the mix with a 240GB solid state drive aimed at the desktop market. I say desktop because their solution utilizes the PCI Express 2.0 x2 interface rather than SATA. Traditional SATA-based solid state drives have pretty much maxed out the available bandwidth over that interface but PCI Express affords much faster speeds. 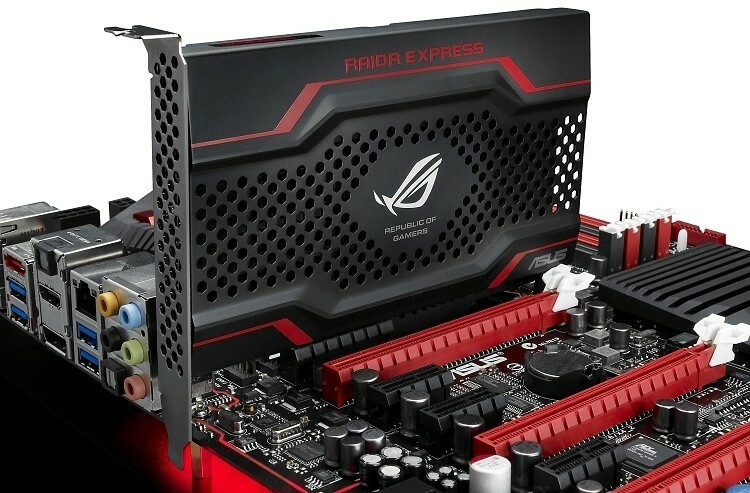 Coming in under the Republic of Gamers banner, the RAIDR Express 240GB card utilizes two SandForce controllers linked to 19-nanometer Toshiba MLC NAND. As you might have guessed, two controllers on one card can only mean one thing – RAID. Asus elected to configure a RAID0 array for maximum speed and that’s exactly what you’ll get. We are told the card offers peak sequential read speeds of 830MB/sec and peak write speeds of 810MB/sec. 4K random read and write speeds are clocked at up to 100,000 IOPS. Unlike some other PCI Express SSD solutions already on the market, Asus made sure to implement TRIM support so performance over the long haul shouldn’t be a concern. What’s more, the card comes with a bit of versatility built in thanks to a physical DuoMode. This switch allows the SSD to work seamlessly with BIOS-driven boards as well as newer UEFI motherboards. Copies of RAMDisk and ROG HybridDisk are also included in the retail package should you want to use the drive as a RAMdisk or combine it with a traditional HDD as a caching device. Pricing and availability wasn’t mentioned in the press release. If Asus can price the card competitively, they could have a winner on their hands given the solid feature list and TRIM support.